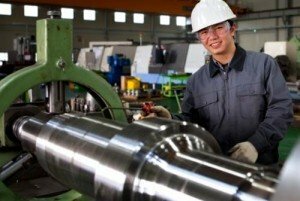 As a career, an Industrial Machinery Mechanic is a quickly growing career. Machines have evolved substantially within the past decade and there is a strong need for skilled experts to maintain and repair them. If you are looking to advance in this career option, then there are some critical steps that you will need to take and some things that you need to know. Enroll in an academic program that can teach you all about machinery and how machines work. You may also want to learn how to perform maintenance on machines in case you are ever called to work on it. Enroll in a secondary education program by visiting your local college and take some industrial technology classes. Focus on classes that involve mechanical drawing, math, reading of blueprints, computers and other electronic classes. When you get hired on at your place of employment be willing to take all the training courses that your boss will require you to do. Some of the training programs can take up to year to complete. Some jobs may require you to have a minimum of an associate’s degree in industrial maintenance before they will even think about hiring you. If you see yourself moving up the ladder into management, then you may want to go and get a degree in management or some other type of leadership degree. Work on developing qualities that deal with solving problems, troubleshooting and thinking outside the box. As an industrial machinery mechanic you can expect to see a salary that averages $44,160 per year. Just keep in mind that if you are just starting out, you will have to work for several years before you are making this level of income. The average per hour wage for this position comes in at an average of $21.23 per hour. As of 2010 there were 357,000 machinery mechanic positions and that number is expected to rise by 19 percent over the next 10 years which comes out to be an additional 66,400 jobs. Your job may require you to repair and maintain pieces of equipment that is vital to the operation of the company. You may have to perform preventive maintenance checks every day on different devices. Expect your work environment to make you wear protective clothing like a hard hat or safety goggles. You may have to wear hearing protection and gloves from time to time. Full time hours may be available with the occasional overtime popping up from time to time. There is also a good chance that you will have to work weekends and even the night shift in order to work on a machine because it is not in use during the off days. A machinery mechanic is a great career with a rewarding future. As companies continue to grow and seek new ways to bring products to market they will need to have the machines to make it happen. They will also need to have people that have the knowledge to keep the machines running during the long work hours.